Heat the oven to 425°F. Chop the tops off the beets, leaving about an inch of green on the bulb, and set aside. Cut each beet into 4 to 6 sections as you would an apple. Each wedge should have a little green on top. Put the beets on a baking sheet. Drizzle over the olive oil and the honey and toss to coat well. Season with salt and pepper. Roast for about an hour. They will be crispy on the outside and soft on the inside.Meanwhile, heat a couple of tablespoons of olive oil in a sauté pan add shallot and garlic until tender then add the chopped green beet tops and sauté until tender, about 5 minutes. Season with salt and pepper. Serve with the roasted beets. This entry was posted in Appetizers, Breakfast/Brunch, Vegetarian. Bookmark the permalink. 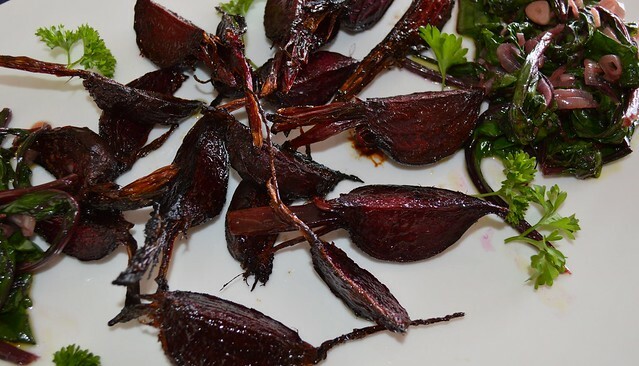 Oh my…we love beets, especially roasted! These would be perfect with Easter dinner, thanks Norma! Look at that amazing colour! Those roasted beets look fantastic, Norma. Beet and shallots a great combo along with your touch. Beautiful job … love the look with the stems attached. I love Laura Calder, I love beets. What’s not to love. 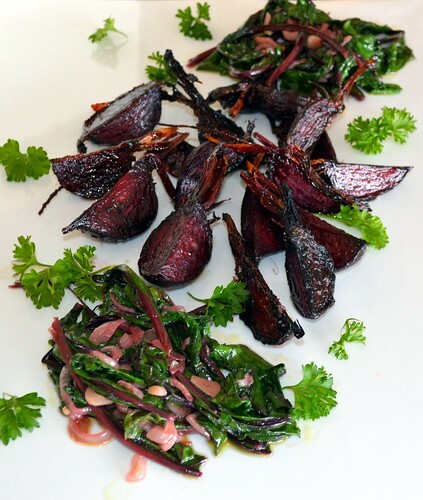 I adore roasted beets and so happy to see you using the beet greens, as well – yum! I’ve roasted many a beet, as I love them, but never with honey. Looks perfect and I love the use of the greens as well. You haven’t skipped a beet Norma! 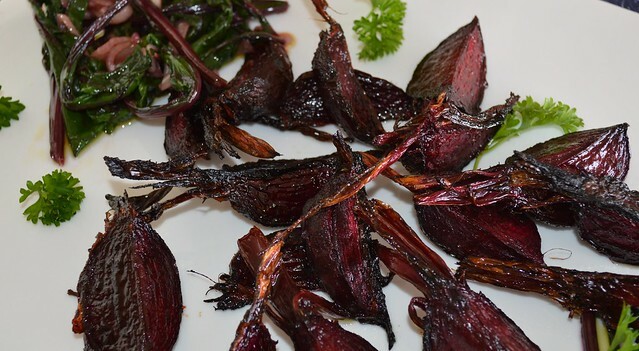 haha The roasted beets are delicious. Trying this today with those beets waiting for a plan. I actually have honey, shallots and some garlic to bring to the party too. yay !